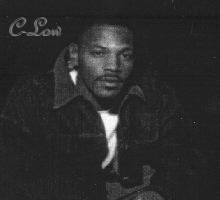 C-Low's rendition of "Do It Like Dis" says it all about this most talented artist. I was born Shawn Marcello Chubbs on May 4th 1971 in the small country town of Foley Alabama. While very young the full range of music excited me to no end. I really liked Rap, R&B and Jaz. Most of the other styles influenced my unique soulful way of singing. As a result of being so young I did not understand what music was all about. I just wondered how they were able to do it. I got myself a radio and started to listen and learn. Music became my favorite hobby. I moved to California in 1985 in pursuit of the love of my life " music". I felt this was the place to chase my dream. Using Beat machines, turn tables and bussing rap, me and some of the homies from around the way started a singing group. They use to called me e-z money. More on that later. My middle name is Marcello, I took the last five letters removed the EL and added the W. That is how I got C-Low. Kinda unique ha. "smile". What you have read is me, a very strong hung talented artist. Other hobbies include fishing Art, basketball, football and hockey. Select the item that best describe your musical talent then let us know how to contact you.